Typhoon Ruby is now in Philippine Area of Responsibility and PAGASA had raised Signal Number 2 in 11 areas on the morning of December 5, 2014 though it hadn’t made landfall yet. Typhoon Ruby is still following the track towards Eastern and Northern Samar as of the midday of December 5 per Inquirer. 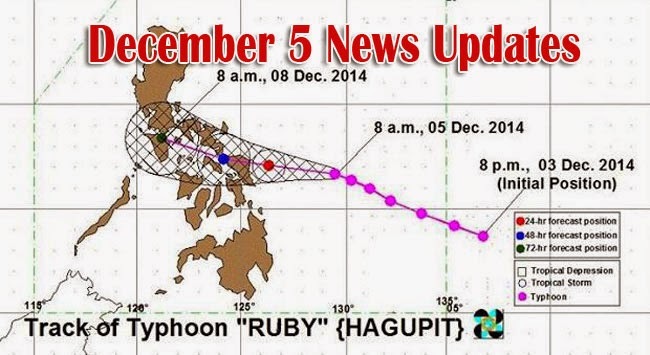 PAGASA said that typhoon Ruby is now sustaining winds of 215 km per hour with the gustiness of 250 km per hour. As of the midday of December 5, Ruby is located by about 435km east of Borongan, Eastern Samar and is moving at the direction of west nortweast at 13km per hour. Signal No. 2 is put up to areas which are expected to experience winds of 61-100 km per hour for at least 24 hours. Signal No.1 will be on the areas which will experience winds of 30 to 60 km per hour for at least 36 hours. Typhoon Ruby has the maximum diameter of 700km and is expecter to pour heavy to intense rain of about 7.5 to 20 mm per hour. Storm surge is also expected to areas near the sea. Fishing vessels are discouraged to go to the sea while ships in the piers had canceled their schedules. Airports also canceled some of their flights that might be affected by the typhoon. Filipinos are encouraged to keep stocks of food, first aid kits and flashlights while those in low laying areas are asked to evacuate in their designated evacuation areas.